Welcome to Roanoke VA "Star City of the South".Nestled in the shadows of the Blue Ridge Mountains, the newly remodeled Holiday Inn Valley View offers easy access to the sights and sounds of the Roanoke Valley. Thanks to our close proximity to businesses and attractions in Roanoke, Virginia, our hotel is the ideal choice for any business or leisure traveler. 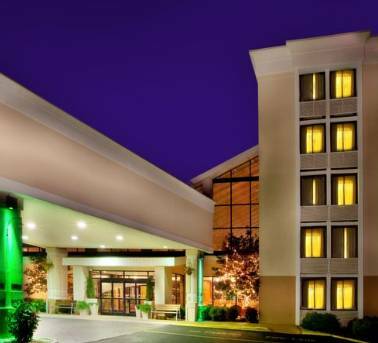 The hotel is located just a couple of miles off Interstate 81 and convenient to the Roanoke Blacksburg Regional Airport, Downtown Roanoke, and many of the national and local businesses located in the Roanoke Valley. Our free hotel shuttle makes trips to and from the airport throughout the day and evening. For guests who enjoy the outdoors, the Blue Ridge Parkway is just a short drive from the hotel and offers miles of hiking trails and breathtaking views. For our corporate travelers, our hotels accommodations provide comfort and convenience for optimal productivity, including access to our 24 hour Business Center. Need meeting space, we have it. With over 11,000 sq ft which includes two new large meeting spaces, we can handle up to 300 seated guests in each room. For those who like to keep a workout regimen, our new Fitness Center provides the perfect place to burn those extra calories or use our partner Golds Gym. Our friendly staff and hospitality set us apart from the rest, so on your next visit to the Roanoke Valley, choose the Holiday Inn Valley View. Black Birch Restaurant & Tap House: Located in Hotel Lobby, our newly renovated restaurant will be serving a new menu of American Fare, including our new Black Birch Burger, Chicken Dishes, Salads and Steaks. Black Birch Restaurant and Tap House: An open air atrium style that you can relax all of your worries from the day! Childrens's program - Valley View Mall with various children activites. Chuck E Cheese is 7 miles, Science Museum of Western Virginia located Downtown. Green Ridge Park with Indoor water water during winter and outside water park during summer. Magnolia Ballroom: Large comfortable spacious ballroom with 4400 total square feet of flexible space. Dogwood Rooms: Warm cozy atmosphere consiting of natural lighting with interior designed window treatments. Consisting of 2,000 square feet that can be divided into 5 individual parlors. Valley View MallSouthwest Virginia's largest complete shopping center. Anchor stores include: Macy's, Belk, J.C. Penney and Sears. Complimentary hotel shuttle. Many nationally franchaised restaurants surround mall. Valley View Cinema 16 screens theater also there. Hanging RockOverlooking the beautiful Roanoke Valley, Hanging Rock Golf Club is surrounded by breathtaking natural beauty. The course, designed by Russell Breeden, offers a championship layout that guarantees golfers of all skill levels an exciting round. BallyhackThe 190-acre Lester George-designed 18-hole course is a classic Scottish highland-type design incorporating the topography of the property. Fairways as wide as 150 yards, the course will set new benchmarks in modern golf course design. Appalachain TrailHike the beautiful Appalachian Trail and start at Dragon's Tooth or head to MacAfee's Knob for breathtaking views of the Roanoke Valley. Blue Ridge ParkwayThe Blue Ridge Parkway offers beautiful vistas, abundant of wildlife and many trails for hiking. Enjoy temperatures 10-15 degrees cooler than downtown Roanoke on this drive. Center in the SquareHosting attractions from the Science Museum to the History Museum of Western Virginia, you are sure to find a day filled with family fun! Dixie Caverns & PotteryWould you believe a dog was the first one in the hole at the top of the hill... That was in 1920. There have been many changes over the years in lighting and passageways. Dixie Caverns is open for tours 363 days a year. Martinsville SpeedwayA part of the Nascar Racing Circuit, Martinsville Speedway is the short track that all of the fans and racers love. Natural BridgeThe immensity is startling the majesty is striking. 20 stories of solid rock, carved by the fingers of nature---Virginia s Natural Bridge. Salem Civic CenterSporting events, concerts, the Salem Fair and many other family oriented events all take place at the Salem Civic Center. Check out their website to see what is happening when you are here in Roanoke. Smith Mountain LakeMan-made lake covering land in 2 counties. Fishing, boating a swimming a must! Valley View MallShopping Center that has four anchors stores including JC Penneys, Sears, Macy's & Belk. Many other national franchise shopping venues also located inside mall. Virginia TechNestled in the Blue Ridge mountains, Virginia Tech is one of the premier college universities in the country. The stone exterior of many of the buildings was mined from the mountains that surround the campus. Berglund Center formally Roanoke Civic CenterMany concerts, conferences, sporting events, festivals and craft shows are held at the Berglund Center formally known as the Roanoke Civic Center.